They can be harmless or indicative of very serious eye problems. Almost everyone has experienced spots floating in his or her field of vision. Typically, they are seen in the same eye and in the same part of that eye. Sometimes one can make them disappear by merely turning the head, moving the eyes, or blinking. When the spots appear rather fuzzy and seem to be strung together with a web-like thread, they are called floaters. Flashes are bright points of light that literally flash into the field of vision when the eyelids are open or closed. They usually appear as if someone is shining a flashlight from the side of your eye. Flashes come and go in an instant and normally occur in only one eye at a time. They can indicate vitreous detachment or a serious eye disorder. Both flashes and floaters can be harmless symptoms of aging eyes, or they can be indicators of a serious eye disorder such as a torn retina. Therefore, if you experience new symptoms, you should call the office immediately and have your eyes examined to determine if this is a sight-threatening condition. The center of the eye is filled with a clear, jelly-like fluid known as the vitreous humor. Often, small flecks of protein or other natural matter become trapped in the vitreous during the formation of the eye before birth. These particles remain in the vitreous throughout life and are occasionally seen as spots or floaters. Spots and floaters can also be caused by deterioration of the vitreous or the retina as part of the natural aging process. During childhood, the vitreous is like jello. As we age, the vitreous begins to become more liquid and loses its gel-like consistency. Then if a sudden collapse of the gel occurs, this can cause the vitreous to separate which causes microscopic particles to "float" within the eye, casting tiny shadows on the retina. We see these floaters as specs, bugs, strings or webs depending on their shape. Although distracting and annoying, these naturally formed spots and floaters rarely cause a loss of vision. However, spots and floaters can also indicate serious retinal problems. These can occur spontaneously or result from injury to the head or eye. 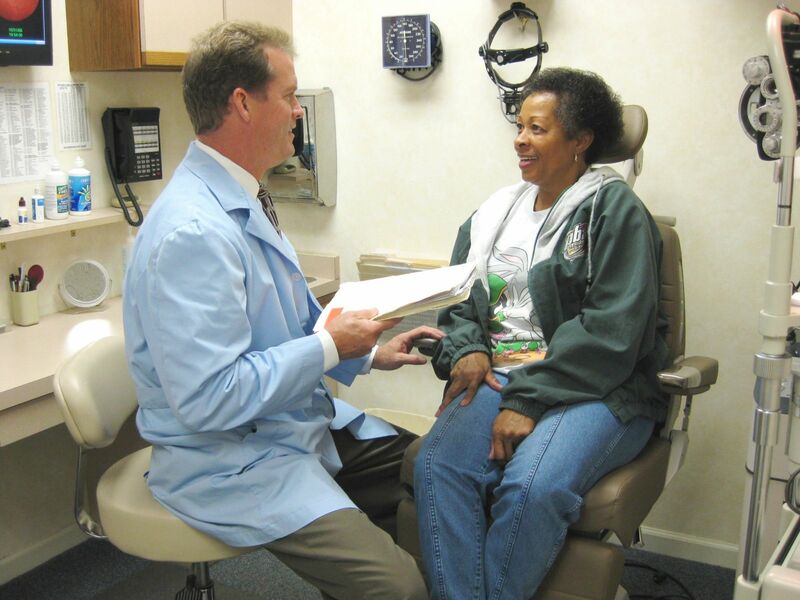 Serious diseases such as diabetic retinopathy or macular degeneration may also cause spots and floaters. Many of these conditions can lead to a retinal tear or a retinal detachment, which is a very serious condition resulting in a partial or total loss of vision. What causes flashes and vitreous detachment? As one grows older, the vitreous humor that fills the center cavity of the eye becomes more liquid and begins to shrink. This causes the vitreous to pull away from retina creating occasional bright bursts of light or flashes that are seen when the eyes are closed. These flashes usually cease in a matter of days or weeks when the vitreous has fully detached from the retina. Some people will continue to see occasional flashes caused by the loose vitreous scraping or bumping against the retina. Usually, this happens when the head is moved suddenly, or when you go into a dark room. If you have ever bumped your head so hard that you saw stars, this is the vitreous bumping against the retina. Except when they are symptomatic of a torn retina, flashes, like most spots and floaters, normally occur in an aging eye. 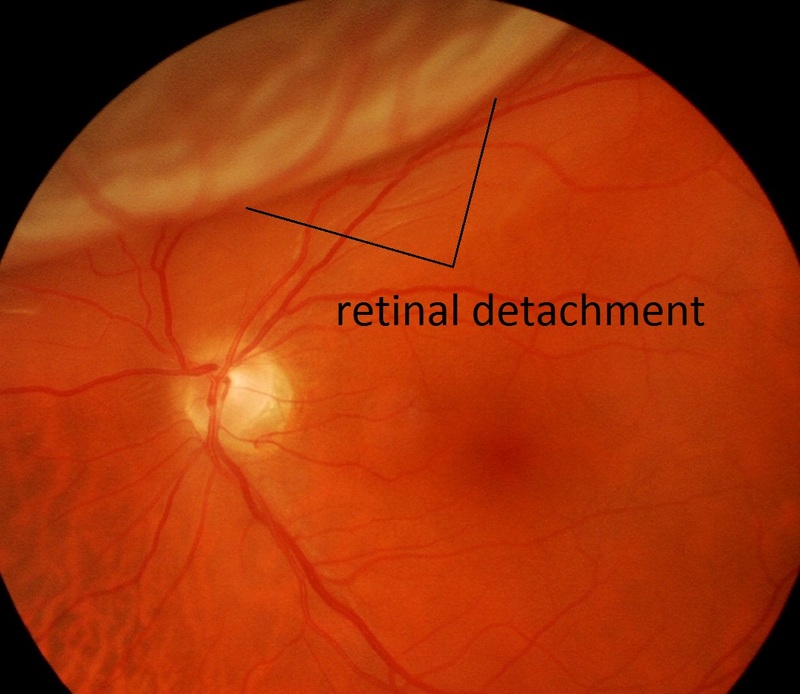 IF YOU HAVE A SUDDEN ONSET OF FLASHES, YOU NEED A RETINAL EVALUATION ASAP, so as to rule out a Retinal Detachment. There is no viable treatment for any of these conditions themselves, but there is a treatment for the serious eye disorders of which they might be symptoms: retinal tears or retinal detachments.A retinal tear can usually be successfully treated by a laser that "tacks" the tear back in place. The procedure can be performed in the office and usually takes only a few minutes to complete.It is critical that a retinal tear is repaired as soon as possible. 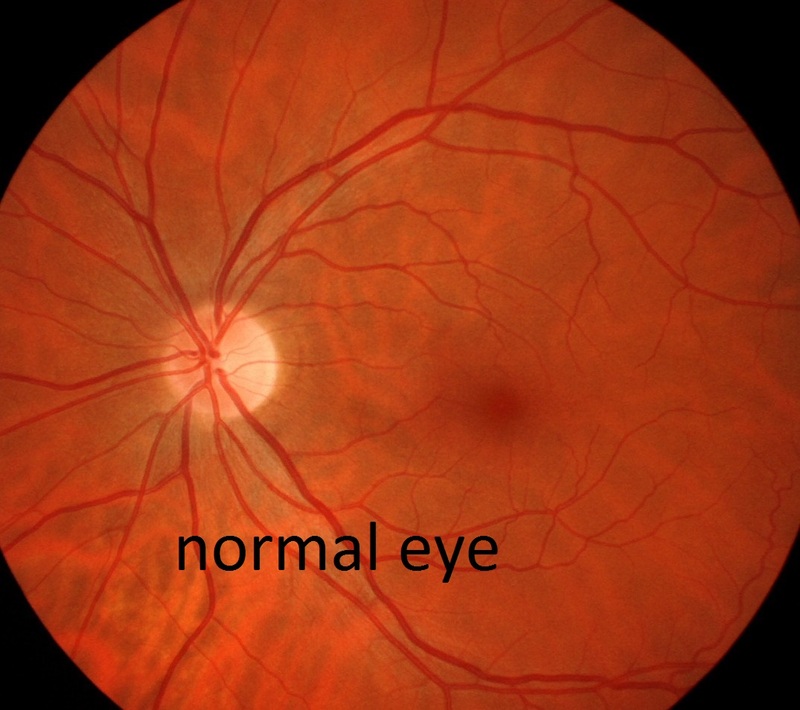 Untreated, it could lead to a retinal detachment and permanent loss of vision. The laser can also be used to treat a retinal detachment, but often times a more involved surgical procedure is needed for repair. 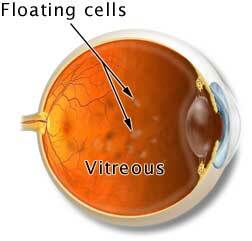 Floaters can signal retinal problems. Occasionally, floaters signal a more serious eye problem, such as a retinal tear. The retina is a very fragile membrane that lines the inside of the eye, coming in direct contact with the vitreous. If the vitreous separates, it can pull on the retina at these attachments and cause it to break or tear, especially if the retina has weak spots. 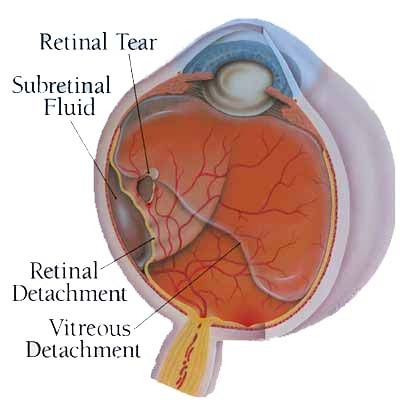 When a tear is present, fluid from the vitreous leaks under the retina and separates it from the underlying retina causing a potential sight-threatening retinal detachment. An eye exam is your best assurance. Not everyone who has floaters develops a retinal tear. About 1 in 10 who experience a shower of floaters and flashes of light will have a retinal tear. The sudden appearance of a cobweb type floater by itself is often times harmless, but it needs to be evaluated ASAP to ensure that there is not a beginning Retinal Detachment. Early detection and treatment of retinal tears are essential in preventing vision loss. Do flashes and floaters every go away? Flashes may persist for several months and may occasionally last close to a year. They are caused by the movement of the collapsed vitreous bumping or tugging in the retina within the eye. They are most apparent in the dark Floaters may gradually diminish as time goes by, but they will not go away completely. They are most apparent against a light background. 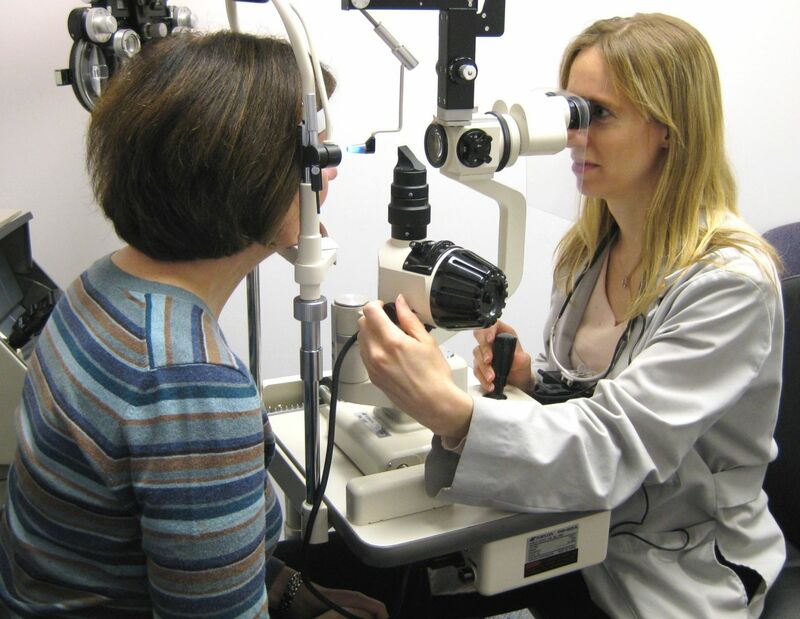 If you experience flashes or floaters, we recommend you have an eye examination. Floaters are the specs, bugs, and threads that dart in and out of your field of vision. Floaters occur as the eye ages and, while annoying, are usually harmless. Floaters that appear suddenly or are accompanied by flashes of light can signal a retinal tear or detachment. Early diagnosis of retinal tears and detachments can lead to early treatment and may prevent vision loss. Floaters or spots in the eye can be the beginning of a retinal detachment.